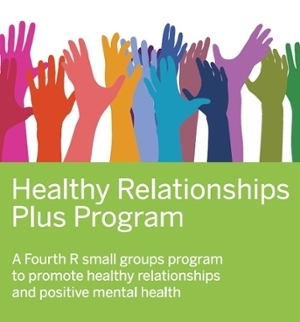 The Healthy Relationship Plus Program (HRPP) applies the same core principles of skill building and awareness as the Fourth R classroom-based programs, but in a non-classroom setting. This project targets the prevention of violence through the promotion of positive, healthy relationships. Ours is a proactive, competency-enhancement approach rather than a treatment. The HRPP is a small groups program (6-25 youth) and has been enhanced to include a strengthened focus on mental health and suicide prevention, and drug and alcohol use. This program is intended for youth between the ages of 12 and 18. We strongly advise that younger youth not be included because the content and strategies were specifically selected for this age group. In the spring of 2014, the Fourth R was awarded a grant through Health Canada’s Drug Strategy Community Initiatives Fund to implement, evaluate, and scale-up the HRPP across Canada over three years. Through this grant, the Fourth R was able to provide HRPP training, implementation manuals, and ongoing support to program facilitators at no cost to schools or community agencies. During the 2014-2015 school year more than 1200 youth from Ontario, Saskatchewan, Alberta, and the Northwest Territories participated in the HRPP. We are continuing the implementation of the HRPP during the 2015-2016 school year with over 40 groups participating so far. For information on the HRPP, please contact Susan Dale, Program Development and Implementation Coordinator, at 519-661-2111 ext. 82774 or at sdale25@uwo.ca. Webinar #1 - What is HRPP?